Made it out to Milan Dragway yesterday to get some times before I tear it down to install an 8.8 that I built. My best before was 11.97 with a 1.71 60' and I saw that the DA was going to be good so I was hoping for the best. 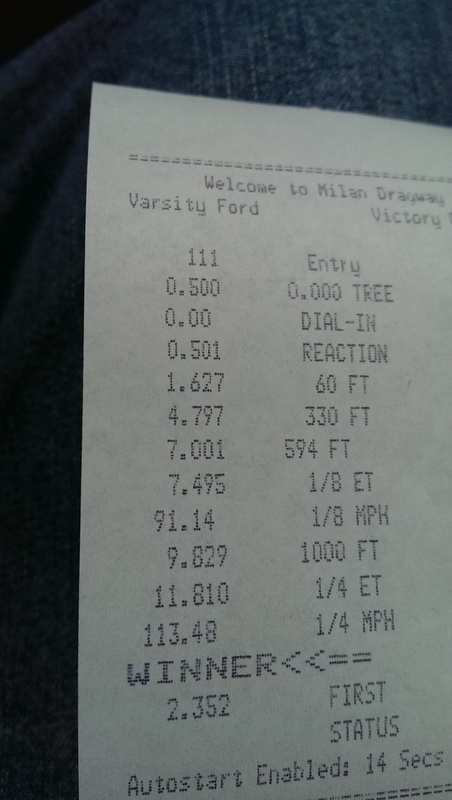 First pass was 11.89, then 11.84, a couple 11.82's, then the 11.810. Last edited by Hardtop Brian; 12-19-2017 at 06:16 AM. Badass man! Mind listing what you have? Last edited by Hardtop Brian; 05-11-2016 at 06:51 AM. Awesome runs. What psi did you have the tires set to and what weight reduction do you have besides the k member and seats out? Awesome runs. What psi did you have the tires set to? Nice, what rpm are you shifting at? Hardtop. What true td system you running? Texas Speed with Borla ProXS mufflers. Bullets were to loud for me on the street lol. I bought the car completely stock, drove it a week, then tore it down over the '14/'15 winter and did all of the mods so I couldn't tell you. Ok thx congrats on a great pass! Great run man congrats! Cummins almost ate it right before you it looked like. Nice! If your gonna stick with bolt-ons maybe consider adding a FAST 92 and a dyno tune... bet she'll go 2 or 3 tenths faster.